Lance Laker admits he was a very anxious high-schooler. “Anxiety is real, it’s very normal, but it is important to address it in the right way,” said the Thornapple High School resource room teacher. 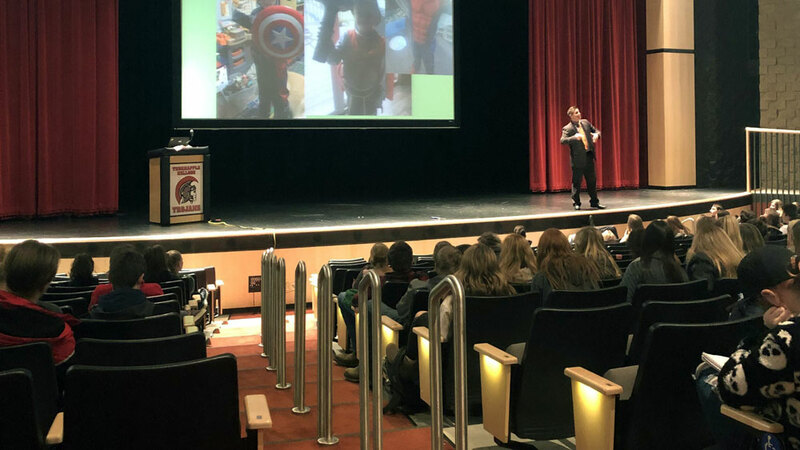 Laker’s admission to students came during the first of a series of assemblies called “Making it Right to be Real,” a program that builds off the “Making it Cool to be Kind” initiative currently active at the high school. Every month, an assembly with a focus on a different area of mental health will be held for each high school grade level, culminating in a school-wide assembly. Assembly topics were determined by a panel of high school teachers, science teacher and football coach Jeff Dock, and school counselors Ross Lambitz, Nancy Iveson and Jamie Nelson. February’s assembly will focus on depression and difficult circumstances students face. The first assembly told the story of Welles Remy Crowther, an American equities trader and volunteer firefighter who saved at least a dozen people during the September 11, 2001 terrorist attacks in New York City, during which he lost his own life. Following the story of Crowther, known as “the man in the red bandana,” every student in the audience received a piece of red cloth. Having both a visual and vocal reminder of support struck freshman Keeley Datterfield as a particularly good idea. High school social worker Megan Roon also touched on the importance of taking moments to disconnect from sources of stress. For freshman McKenzie Cooper, disconnecting can be a bit of a challenge, she said. Coping mechanisms for students will be posted around the school and students are encouraged to find an outlet that helps them feel in control while in and out of school, Roon said. As someone who understands first-hand the stress students feel, Keeley thinks more efforts like the assembly series should be made, even outside the community. Starting this month, the high school will have a table in the main hallway called “I have time,” where teachers will volunteer to give students a chance to talk about challenges they are facing. Freshman Morgan McCrumb thinks the school’s efforts to create ways to hear about mental health “is good for people who don’t want to outright announce the issues that they are having.